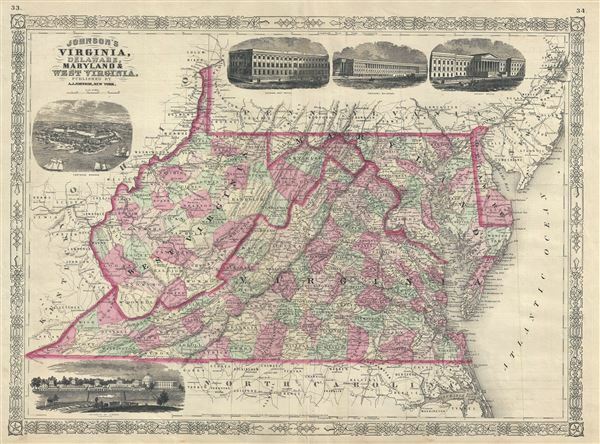 This is a beautiful example of A. J. Johnson's 1866 map of Virginia, West Virginia, Maryland and Delaware. This map offers a fascinating snapshot of these secessionist states shortly following the close of the American Civil War. The map shows all four states in full with color coding according to county. Throughout, Johnson identifies various cities, towns, rivers and assortment of additional topographical details. Five engraved views are included: the lower left quadrant there is a view of the 'University of Virginia,' the upper left quadrant features a view of 'Fortress Monroe,' and the upper right quadrant has three views, the 'General Post Office,' the 'Treasury Building,' and the 'Patent Office.' This map went through several different states and was updated regularly throughout the Civil War. With its five attractive engraved views - this is perhaps the most decorative. The map features the fretwork style border common to Johnson's atlas work from 1863 to 1869. Although copyrighted to 1865, this map was published by A. J. Johnson as plate nos. 33 and 34 in the 1866 edition of his New Illustrated Family Atlas of the World.